Josiah Henson, 1789-1883, John Lobb, 1840-1921, edited by, and Harriet Beecher Stowe, 1811-1896, preface by Uncle Tom's Story of His Life. An Autobiography of the Rev. 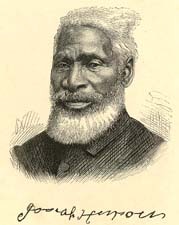 Josiah Henson (Mrs. Harriet Beecher Stowe's "Uncle Tom"). From 1789 to 1876. With a Preface by Mrs. Harriet Beecher Stowe, and an Introductory Note by George Sturge, and S. Morley, Esq., M. P.
London: Christian Age Office, 1876. African American abolitionists -- United States -- Biography. Blacks -- Canada -- Biography. Fugitive slaves -- Canada -- Biography. Plantation life -- Maryland -- History -- 18th century. Slavery -- Maryland -- History -- 18th century.